And General Motors has a big change in the next generation Corvette being revealed July 18. GM confirms the engine in the new model is being moved from under the hood to being tucked between the passenger compartment and the rear wheels — a "mid-engine" design. Chevrolet says the new generation Corvette will be "the sum of each generation before it," but will "stand alone as the new standard of performance." Previewing the reveal, General Motors released a photo showing GM Chairman and CEO Mary Barra standing next to a camouflaged, next generation Corvette on Thursday in New York. The sports car is manufactured at a GM plant in Bowling Green, Kentucky. if it's true, I might want one! She don't look nothing like Danica! I'll reserve judgement and comments until I can touch one. I'll reserve judgement and comments until I can price one. I wii save judgement until I actually see the car. I've already taken a deposit on one. Since Toyota screwed up with the Supra, it looks like I'll remain a Corvette guy. Not that I wouldn't have had another Corvette anyways, but 2-3 years in on a brand new architecture...gotta let MG solve all of the BS that ALWAYS comes out with their new cars, I'll likely go the route of the Z06 variant. Base with 500 is nice, and I can't afford the Zora, but the Z06 is in my wheelhouse. No room for three sets of golf clubs - Fail. We got this from GM the other day. • The final seventh gen Corvette — a black 2019 Z06 model — will be auctioned at the Barrett-Jackson Northeast sale in Connecticut June 28. Q. When will we know more about Dealer Enrollment, Allocation, Earned Methodology, etc.? A. Chevrolet will be providing all of this information in the next few weeks. Q. Where do you plan to introduce the next gen Corvette? A. We are not discussing the reveal location at this time; however, the reveal date is July 18th. Q. 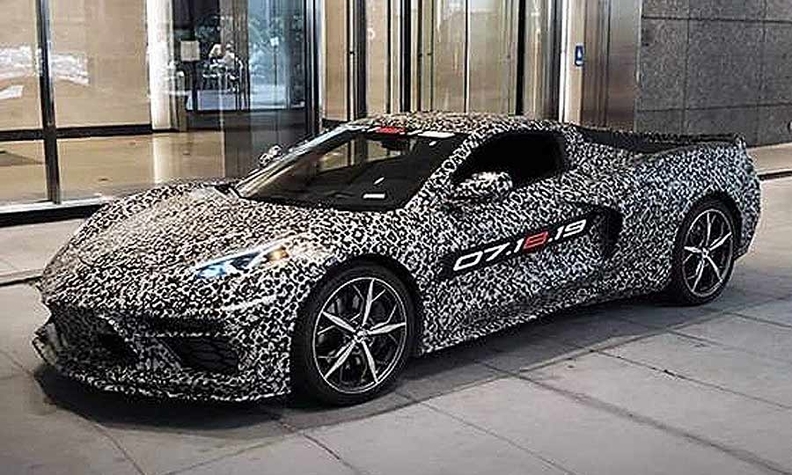 Can you confirm the next generation Corvette is a mid-engine configuration? A. We are not confirming any product details at this point in time. Stay tuned until July 18th. Q. Will the reveal be open to the public? A. No, the reveal will be for invited guests only. As timing gets closer, more information will be shared on Chevrolet social channels and through Chevy.com/nextgenCorvette. Public will be able to view the reveal LIVE online. Q. How does someone get on the invite list? A. Chevrolet and its partners will be determining those invited to the onsite reveal. Those invited will be notified in the near future. Q. When does the next gen Corvette go on sale? A. We are not discussing the on-sale dates of the next gen Corvette at this time. Q. Will you continue to produce the current Corvette alongside the next gen? When will C7 production end? A. We are not sharing any production details at this time. Q. Why is it taking so long to reveal? A. As with all of our products, we bring them to market only when they meet our stringent safety and quality standards for engineering excellence. We will share more details on July 18th. Q. Does the final C7 being auctioned in June mean production will end before then? A. A black Z06 with the same configuration as the final C7 will be used at Barrett-Jackson in June as a representation of the final car to be built at a later date. Q. Can you confirm the next generation Corvette will be built in both LHD and RHD? A. We are not confirming any product details at this point in time. All times are GMT -5. The time now is 03:27am.